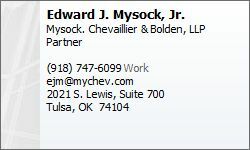 Edward J. Mysock, Jr. - Mysock, Chevaillier & Bolden, L.L.P. Ed Mysock has been in private practice in Tulsa, Oklahoma, for over 30 years after working for an international public accounting firm. He graduated from the University of Pennsylvania, Wharton School, with a B. S. in 1969, and from the University of Tulsa with a J.D. in 1976. He served in the U.S. Marine Corps. from 1969 – 1973. Mr. Mysock is a member of the Oklahoma Bar and the Missouri Bar and is authorized to practice in Oklahoma courts, the U. S. District Court for the Northern District of Oklahoma and the U. S. Tax Court. His practice areas emphasis are business transactions, taxation, and estate planning.